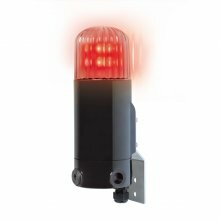 Hazardous areas often require the use of optical signals for warning, information or signalling purposes. The Expertline-LED provides these signalling options. The available operating modes are continuous light, strobe light, blinking light and rotating light, and turning on the supply voltage activates the device. The Ex-light is equipped with high-performance light-emitting diodes (LEDs) and comes in the colours white, red, yellow, green and blue. The housing conforms to protection degree IP66 and is suitable for both indoor and outdoor use. The DIP-switches for adjusting the operating modes have the ‘intrinsically safe’ type of protection. A V4A metal bracket serves as wall mounting. The device may be operated in any position.